Not for sixty years has a book been so brutally (and, in the end, unsuccessfully) suppressed as “An Eye for an Eye”. One major newspaper, one major magazine, and three major publishers paid $40,000 for it, but were scared off. One printed 6,000 books, then pulped them. 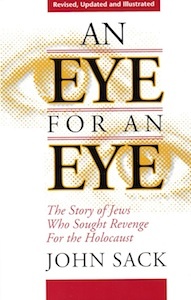 Two dozen publishers read “An Eye for an Eye” and praised it. "Shocking," "Startling," "Astonishing," "Mesmerizing," "Extraordinary," they wrote to author John Sack. "I was riveted," "I was bowled over," "I love it," they wrote, but all two dozen rejected it. Finally, Basic Books published An Eye for an Eye. It "sparked a furious controversy," said Newsweek. It became a best-seller in Europe but was so shunned in America that it also became, in the words of New York, "The Book They Dare Not Review."